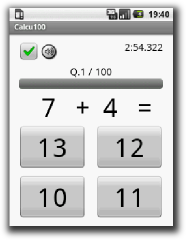 Calcu100 is the quick Calculation game. Let's strengthen your count ability. If you answer all question matchings correctly , you will be able to play Hard mode. 2. Tap the start buttun and the game will start. 3. Choose the answer from the four candidates. 4. Answer all questions within time limit. 5. Try your best to answer correctly. 6. You can mute sounds with the checkbox. 7. [Record Button] will show best records when you answered all correctly. 8. [Help Button] will show how to play.